To access the Mastery Report, click in the menu. This report provides an at-a-glance look at who has engaged with their training, what Modules they engaged in, when they last engaged, and their progress towards mastery. The following columns will appear in all Mastery Reports. The other columns may vary depending on the fields (attributes) that appear in your Users view. ProTip: Remember that content in OttoLearn is part of a hierarchy. The name of a Module in one (or more) of the learner's assigned Mastery Profiles. The last date and time the learner completed an Activity in the Module, by completing a mastery moment or practice. Whether or not the learner has reached the mastery goal set for the Module. The learner's current mastery level. 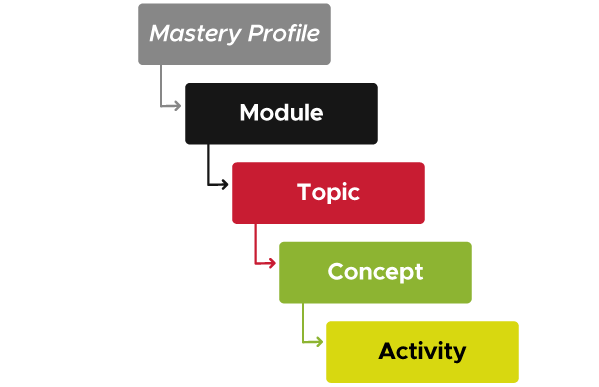 The mastery level the learner must reach to achieve mastery. The percent of the active Activities within the Module that the learner has exercised.